DescriptionTo enable your grown-up one legs to rest while visiting Paris. Stroller wheeled board. Lascal Maxi. Easy to connect and disconnect. Universal fit: the BuggyBoard Maxi fits almost every type of buggy or pram. No matter how many buggies you own, you will only ever need one BuggyBoard. 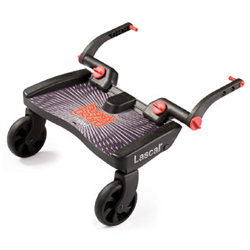 Board leveling system: The easy fit Board levelling system means that you simply choose the best position for the connectors on your buggy, then adjust the arms of the BuggyBoard to suit. Large anti-slip surface: makes the BuggyBoard Safe and Comfortable to stand on – reduces the risk of your child accidentally slipping off their BuggyBoard. Side Protection frame: the frame around the platform provides additional safety for your child. Large ground clearance: high enough for your feet to move under the BuggyBoard as you walk, parents find the BuggyBoard easy to walk behind. Width adjusting: the unique width adjustment system allows your BuggyBoard to fit both narrow and wide prams and pushchairs. Suspension system: independent suspension on each wheel ensures a smooth and pleasant ride – for the child on the BuggyBoard, the child in the pushchair/pram, and last but not least the parent in charge. Lift-n-store system: if the BuggyBoard Maxi™ is temporarily not in use, it can be placed in resting position. The strap is easily adjusted to work with your pushchair/stroller. Connectors are installed before delivery if board is rented together with a stroller. This board fits our EasyWalker, MacLaren and Graco simple models available for rental. If you'd like to rent a stroller board without a stroller, you may check http://www.buggyboard.info/ or contact us to ensure the board fits your stroller. We set up the board to the stroller before delivery to make it even easier for you. You'll then just have one thing to do: enjoy long walks in all areas of Paris ! For tips, child- and baby-friendly addresses (of wich places to have a break during the walks), have a lot to our Visit paris with baby blog. Getting around Paris with a 4 and 2 year old was so much easier with a stroller and skateboard attachment and the box of toys was fantastic for keeping our girls entertained. Camille was very helpful with drop off and pick up arrangements and had some great tips for things to do in Paris with kids. Thank you for your fantastic service and we would highly recommend baby'tems to others.